It has been almost one year since U.S. Attorney General, Jeff Sessions announced that the government was terminating Deferred Action for Childhood Arrivals (DACA), a program which offers work permits and deportation relief to undocumented immigrants brought to the U.S. as children. However, thanks to multiple lawsuits filed in Federal Courts across the country, challenging the legality of the termination of DACA, the U.S. Citizenship and Immigration Services (USCIS) has continued to accept and process DACA renewal applications since January 2018. Under the initial program termination, the U.S. Department of Homeland Security (DHS) was directed to reject all first-time DACA applications received after September 5, 2017, and to reject all renewal applications filed after October 5, 2017. On January 9, 2018, we received the first decision dealing with the termination of the DACA program, Regents of the University of California, et. al. v. Department of Homeland Security. In this case the U.S. District Court for the Northern District of California issued a preliminary injunction which required DHS to continue to accept and process DACA renewal applications. This preliminary injunction applies nationwide. Therefore, individuals who were previously approved for DACA can continue to file applications to renew DACA and employment authorization documents. The government has appealed this decision to the Ninth Circuit Court of Appeals, which heard oral arguments on May 15, 2018. A decision is expected by the end of the summer. Since the Regents decision, we have seen similar preliminary injunctions issued by U.S. District Courts from the Second and Fourth Circuit Courts of Appeal, Batalla Vidal, et. al. v. Nielsen, et. al. and State of New York, et. al. v. Trump, et. al, (2nd Circuit) and CASA de Maryland, et. al. v. Department of Homeland Security (4th Circuit). In the CASA case, the U.S. District Court in Maryland granted a nationwide injunction ordering DHS to follow its original 2012 guidance regarding information sharing for DACA applicants and recipients. Under the 2012 guidance, the Agency will not share or use DACA recipients’ private information for immigration enforcement purposes against applicants or their family members, unless the person poses a threat to national security or has committed certain crimes. On April 24, 2018, in NAACP v. Trump, et. al. and Trustees of Princeton, et. al. v. United States of America, et. al., the U.S. District Court for the District of Columbia ordered the DACA program to be reinstated as it were before September 5, 2017. Thus, under this order, DHS must accept both first-time DACA applications and renewal applications. However, the court stayed its decision for 90 days to allow the government to come up with an explanation as it why it ended the program. Under this order, if the government does not take any action by July 23, 2018, individuals who qualify for DACA but who have never applied for or received DACA, may submit their first-time applications. One other case to watch is Texas, et. al. v. Nielsen, et. al. In that case the state of Texas, joined by six other states (Alabama, Arkansas, Louisiana, Nebraska, South Carolina, and West Virginia), seek a declaration that the DACA program is unlawful and a nationwide order prohibiting the government from issuing new periods of deferred action under the program. Any injunction halting DACA would be conflict with the above noted decisions which have authorized the re-start of DACA, and it is unclear how these conflicting injunctions would be handled by USCIS. Ultimately, it will likely be up to the Supreme Court to untangle potentially conflicting injunctions. The Texas case has been set for scheduling conference at the end of July 2018. Currently, individuals eligible to file for DACA renewal should do so as soon as possible. It is possible that the opportunity to file renewal applications may close within the next weeks or months. Those potential first-time DACA applicants are also strongly encouraged to consult with experienced immigration counsel about the eligibility requirements required for DACA consideration. 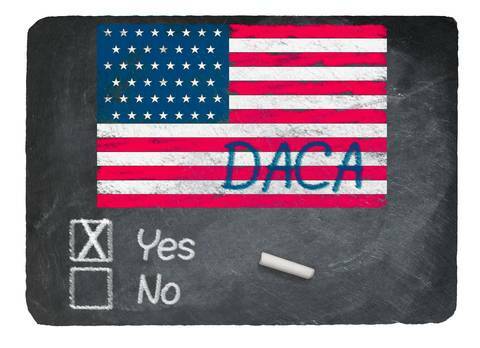 For more information on DACA, the current status of the DACA program, or other information related to immigration issues, please contact Kolko & Associates, P.C.